I made this with Alex and Denny in mind. They have two small boys and need dishes that require low prep time but longer cooking time. In a stockpot, sprinkle about 2T oil and turn the heat up high. 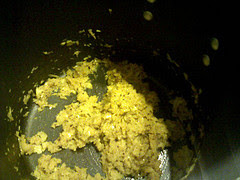 Add the mashed garlic, chili, mustard seeds, curry and turmeric. Stir quickly until the garlic browns. Lower the heat and add the onions. Simmer until translucent. Add the chickpeas and chicken stock. Return to boil. Reduce heat to simmer and add the coconut milk. 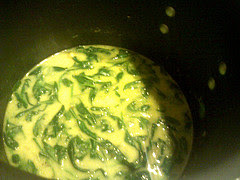 When the soup starts to simmer, add the fresh spinach on top and cover to wilt the spinach, about 2-5 minutes (depends on how much surface area the spinach is covering). Turn off the heat and stir, making sure to snags browned bits that may be on the bottom of the pan either from the tadka or the coconut milk (milk likes to settle and coat the bottom).